Search engines can’t see and can’t click, so there’s a big overlap between making sites accessible and making sites perform well in search engines. Social media also uses several features that improve accessibility. This table shows the relationships between WCAG 2 Accessibility Checkpoints, search engine optimization and social media. The priority levels from WCAG have been used for SEO and social media: A is most important, AAA is least important. Search engines and blind people can't see images, so they need text alternatives to describe important images. ALT text is used in image search, and also used as anchor text when a link surrounds the image. Anchor text helps to determine the topic of the target page, with offsite anchor text given more weight because it's harder to manufacture links on lots of different sites. Currently social media sites like Pinterest and Facebook don't capture ALT text when images are shared. Pinterest uses the image description typed when the user pins the image. Facebook sets empty ALT text for thumbnail images of shared pages - even if the shared page contains ALT text for the thumbnail image. Warning: This is one place where SEO guidelines and accessibility guidelines part company. Both Google and Bing recommend all images should have ALT text (which makes them easier to index for image search) but this harms accessibility by adding noise to the page for purely decorative images. Just like images, search engines and blind people can't see video, so need text alternatives. Sometimes optimizing a site for SEO has the side effect of producing very accessible content. A good example is SeoMoz (a producer of SEO tools) who add transcripts to all their videos to help with ranking. This has the side effect of making the video accessible to the deaf. The CSS content property allows text to be inserted dynamically - a typical usage is adding a page number to the footer of printed documents. Text inserted using the CSS content property is invisible to a search engine. Some low vision and dyslexic users turn off stylesheets, or apply their own CSS stylesheet. This allows users to set combinations of text color, background color and font style that work best for their particular abilities. For these users content inserted via CSS is never displayed. The title tag is crucial for SEO and social media, and very important for accessibility. Title tags identify a page to the user - they appear in lots of different places: search results; browser tab titles, bookmarks and Facebook shares. The title is the most important item on a page for a search engine, and should be written for users. A good rule of thumb is to write titles the same way as a quality newspaper writes headlines. An informative title like "Good title tags boost business results" gets clicked on a lot more often than a keyword stuffed title like "Good title tags, best title tags, cheap title tags, title tag advice". Words at the start of the title are read more often during a quick scan of the results, so carry more ranking weight with the search engine. For this reason, don't put the site name at the start of page titles (other than on the home page). Don't use the same title tag on every page on your site - because the title has a huge influence on ranking this greatly reduces the number of keywords your site will rank well for. 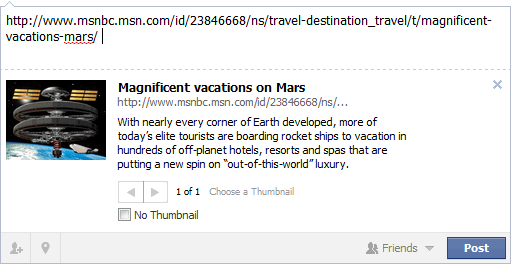 Facebook and Digg show the page title for shared links, along with any meta description. The title is the first thing read when a page loads, and is very important for letting the user know where they are. Having identical titles on every page is very confusing. Search engines use the underlined link text (called anchor text in the SEO world) as a vote on the topic of the target page. If enough anchor text points at a particular page, searching for that anchor text returns the page even if the text doesn't exist on the target page. This has been exploited in the past by Google Bombing. In first two cases the links need to make sense out of context by clearly identifying link purpose. In particular, labeling all your links "Click Here" or "Read More" renders the links useless to screen reader users unless they read sequentially. A single navigation mechanism (such as a navigation bar) may block or slow down some users with disabilities. Providing multiple navigation methods (navigation menus, search and a site map) helps disabled users avoid these blocks. Blind and low vision users may find it quicker to navigate using site search, or search for text in a site map, rather than tabbing through a navigation menus in set of linked pages. Search engines count internal and external links to a page to work out how important the page is. Providing multiple internal links to a page increases the chances that page will be indexed. Headings help the search engine understand the topic of a page. The headings on this blog post help indicate the page is about screen readers, search engines and social media. Many screen reader users read out a list of headings as soon as the arrive at a page to get a quick overview of a page - this is equivalent to a sighted user quickly scanning the page before deciding to hit the back button. They're also used to quickly navigate to the part of page the user is interested in. Without headings the user has to laboriously read the page from the top. Search engines can guess the language of a pages, but sometimes guess wrongly (especially on multi-lingual sites). Without this attribute a French language page on a Canadian site may appear in English search results instead of French search results (or more likely not appear at all). This attribute is used when selecting a voice to read out the page in. Without this attribute a French language page can be pronounced like English in a screen reader (which is unintelligible to a French speaker). Missing comment end tags which can hide large portions of a page from a search engine. This is because the parser has to guess where the comment should end, and may choose the next line, or the end of the next comment, or the end of the page. Unclosed <title> tags also cause problems because the parser has to guess where the title should end, and may drop the title from the index. Missing closing quotes from meta descriptions attributes cause similar problems since the parser has to guess where the description ends. Facebook and Digg displays page title and meta description when a link is shared, so Facebook needs to parse the page in the same way as a search engine to extract this information. The same problems with malformed tags apply. Screen readers rely on the host browser parsing pages before interacting with the browser DOM via accessibility APIs. The way browsers handle malformed code sometimes changes between browser releases. There were parsing changes between Internet Explorer 7 and 8 as well as parsing changes between Firefox 3 and 4. Meta descriptions provide a short description of a page, and are displayed below page titles in search results and shared links in Facebook. The meta description usually appears below the title, with keywords from the user's search phrase in bold. The description should give users a reason to click - a description that says "Under construction" is unlikely to get many clicks. Use language that people actually use in searches rather than corporate jargon, because this means more text is bolded to attract attention which increases the number of clicks. Facebook and Digg show the page meta description just below the page title for shared links. Not used directly by screen readers, but will be read out as part of search results pages returned by Google and Bing. Optimizing a site for search engines and social media usually makes it more accessible. Making a site more accessible optimizes it for search engines and social media. Do both!